Starring Tea Leoni/Dr. 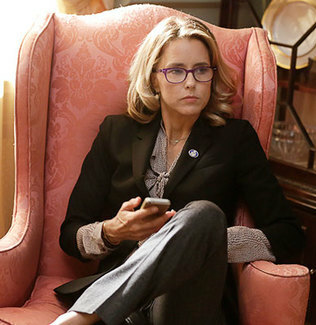 Elizabeth McCord, Tim Daly/Dr. 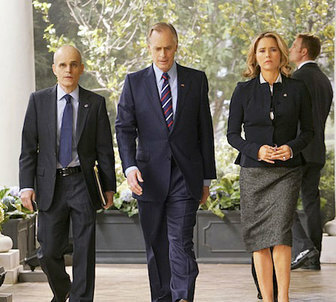 Henry McCord, Bebe Neuwirth/Nadine Tolliver, Keith Carradine/POTUS, Zeljko Ivanek/Russell Jackson. SoS McCord trods the politically correct path of high stakes conflict resolution as she appeals to the better side of human nature in world leaders and Washington insiders. Along the way she circumvents a weekly family drama with her oh-so-understanding mate, Dr. Henry McCord, whether it be trimming the holiday tree to allowing her youngest offspring a chance to play football. And she does it with such a modern maternal flair that it makes CBS's working mom Amy Gray (Judging Amy) look like a drunken sloppy second. All that's missing from Elizabeth's wardrobe is a neon halo. Is it any wonder that former SoS - and 2016 presidential candidate - Hillary Clinton gushes that it's her "favorite guilty pleasure"? Reality is sometimes hard to swallow, especially for a global political figure like Ms. Clinton. 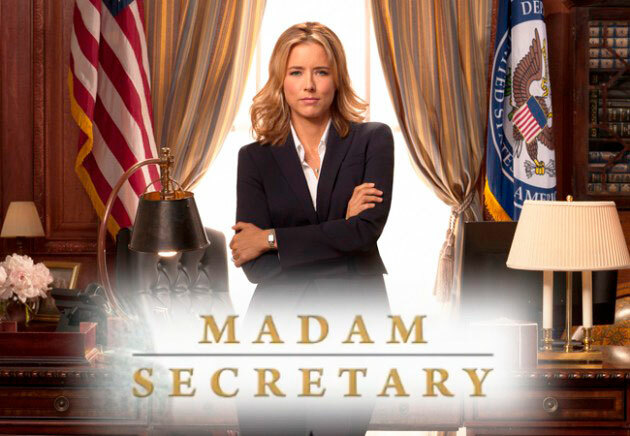 Maybe that's why Tea Leoni was chosen to bring Hillary's avatar to life. Leoni wears her halo with a strained mask of perpetual, long-suffering angst that's impossible to fathom. Is she indicating how serious her job is or that she’d rather be somewhere else? Perhaps a bit of both? Series creator Barbara Hall helms a writing team that tailors character Elizabeth McCord into a one-dimensional suit that threatens to cut off her breath at any given moment. It's galling to see her SOS whine about terrorism, global warming and bellicose superpowers as though hoping her Valium-induced voice will sooth the testosterone firmly seated in the Oval Office into progressive change. 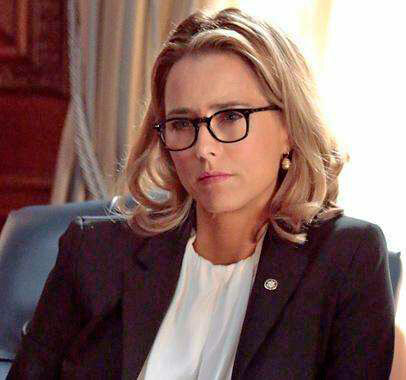 A talent like Leoni diminishes herself in such a role - not to mention as a role model for women aspiring to power - but it's nothing like the tragedy of a truly stupid storyline that Tim Daly has to sleep-walk through. Producer Barbara Hall's Roman Catholic beliefs are echoed by Dr. Henry McCord's lofty day job, teaching theology up on the hill, while he moonlights in the down-and-dirty world of an a NSA operative at night. Maybe Elizabeth and Henry could wear matching halos? Politicians wear a thick coat of entitlement, and are supremely oblivious to it, which makes them almost irresistible - much like the lapdogs that dutifully answer Hillary's imperious texts at all hours. Selena's a perfect foil for Elizabeth McCord's White House brand of activism, because her sole concern is satisfying her momentary impulses, and if it helps the 'greater good' she's just as pleasantly surprised as the rest of us. 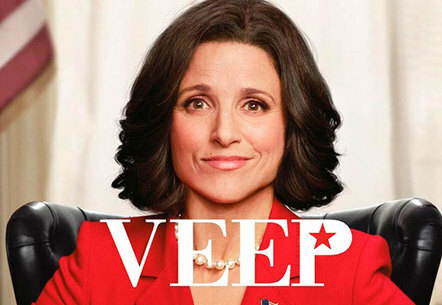 VEEP is really my favorite guilty pleasure. Since 1934, 124 cinematic male presidents have diverted our collective gaze, until television finally lassoed a woman into the Oval Office in 1985, inaugurated by Patty Duke's comedy series, Hail to the Chief. Nine women can say they’ve sat in the President's chair since then - on the small screen, that is. Today it makes better sense to employ television as the medium of choice, because more people - especially women - watch television across multiple platforms, which means reaching more potential voters. But beyond creating the idea of a female Commander-in-Chief is the more powerful act of herding the masses to the voting booth in 2016. 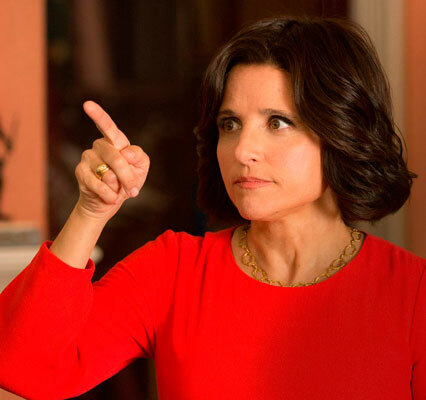 Both Madame Secretary and VEEP steer their fans towards the liberal ticket, which is not surprising, since the White House - and Hollywood - are run by the Democratic Party. Since Mr. Levinson made his observation about television's over-reaching power during Barack Obama's candidacy in his film, Poliwood, social media has created a more informed national audience. Informed - not necessarily smarter - because the process of watching a screen can encourage the thinking centers in our brain to be lulled into a trance state. That's great for suggestibility, bad for critical thinking. And although he was referring to the ease of using television to promote a candidate into the White House, this truth also extends to a television collective creating shows to promote their favored causes and candidates - and enemies. While there's nothing new about such manipulation, the American audience appears comfortable with the practice of tucking propaganda into every facet of our mass media, culture and lifestyles. 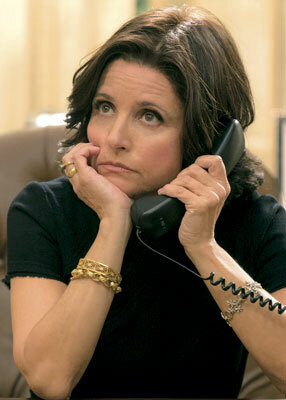 My only complaint is that with all the creative power that thrives in Hollywood, they’re still stuck on offering primetime pablum like Madame Secretary. But okay - it's for the greater good.